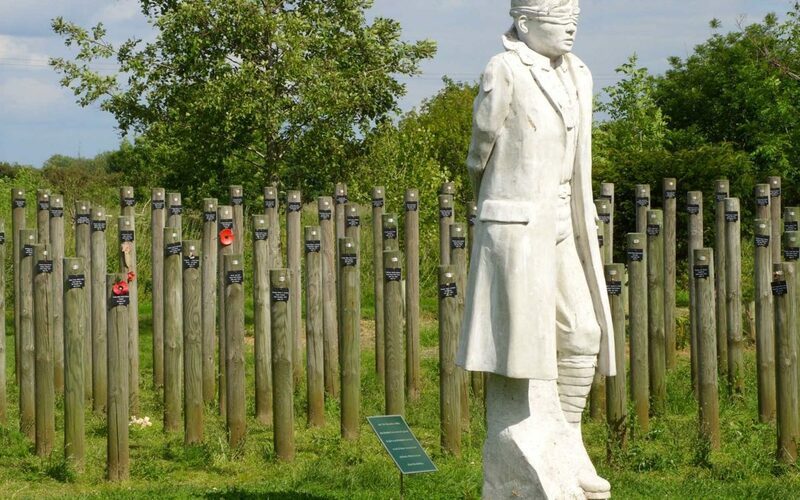 The memorial, In the National Memorial Arboretum is to British Army and Commonwealth soldiers executed by firing squad during the First World War. It is alleged that soldiers accused of cowardice were often not given fair trials; they were often not properly defended, and some were minors. The memorial was created by artist Andy DeComyn as a gift from to the relatives of those who were executed and was unveiled in June 2001. The statue portrays a young British soldier blindfolded and tied to a stake ready to be shot by a firing squad. It was modeled on the likeness of 17-year-old Private Herbert Burden, who lied about his age to enlist in the armed forces and was later shot for desertion. It is surrounded by a semicircle of 307 stakes on which are listed the names of every soldier executed in this fashion.